What are my Treatment Options for Mesothelioma? Not all mesothelioma patients are the same. Some patients are good candidates for surgery while others may respond better to drug treatment without surgery. Simply put, one treatment plan may work for one patient, while it may not work for another. Fortunately, there are a number of conventional, alternative, and new treatments as well as clinical trials that may work alone or in combination to help treat mesothelioma. If mesothelioma is diagnosed, it is important to begin treatment as soon as possible. If you would like speak to a doctor, click here for more medical information regarding your mesothelioma diagnosis and options. The material presented here is for information purposes only, and should not be construed as advising or endorsing one form of treatment over another. 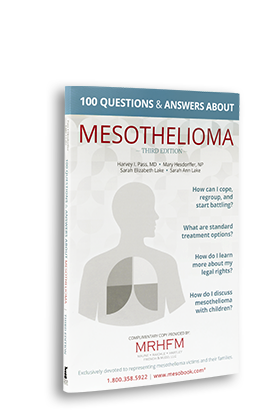 If you wish to learn more about mesothelioma, CLICK HERE to receive a free book written by medical professionals who have treated mesothelioma.